Using a blender on pulse, chop roughly the onions and garlic, holding 2 onions back. Pulse quickly the remaining 2 onions with the parsley but do not blend for long or the parsley will become a purée. In a pestle and mortar crush the cloves, juniper berries and the red baies until moist. In a very large mixing bowl or clean washing up bowl mix all the ingredients together with your hands until the herbs and spices are evenly mixed through the meats. Divide the mixture between the clean, dry kilner jars. Top with a leaf of sage, bay, thyme and a square of pig fat or bacon. Put the rubber seals on the lids of the kilner jars and place into the large saucepan. Fill up pan with water until all the jars are submerged. You may have to cover jars with a tea towel and add heavy weights or stones to stop the jars floating. Put on the gas and bring the pan to a boil – leave to slowly boil for 3 hrs and then turn off. You will have to top up with boiling water once or twice as the kilner jars must remain submerged. Remove wash the jars on the outside, label and store in a dry place for up to 2 years. Serve with home pickled gherkins and crunchy farmhouse bread. 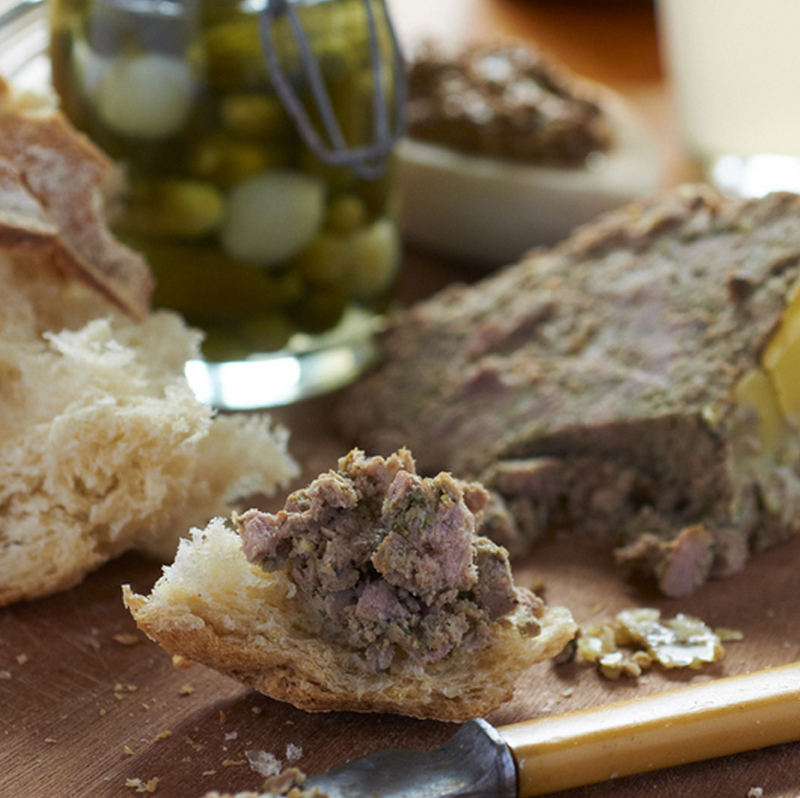 Alternatively you can use your normal pâté dish. Pack the raw mixture in the dish, then scope it out and weigh it. Pack into a freezer bag and repeat until you have several packets, label the weight and mix then freeze until you require them. Take out and defrost a packet overnight in the fridge then cook in the oven in a bain-marie for approx 3hrs. Oven baked pate will have a more caramelised flavour than the kilner jars. Both are delicious, but really do have a totally different flavour.